He's the current partner of Ban Mido and was once the fearsome "Thunder Emperor" and the leader of a gang called "The Volts" in the Infinity Fortress. He received the title "Raitei" (literally, "Lightning Emperor") because of his ability to control electricity. This control grants him several unique abilities such as amazing regenerative power as well as the ability to become a human magnet and battery. 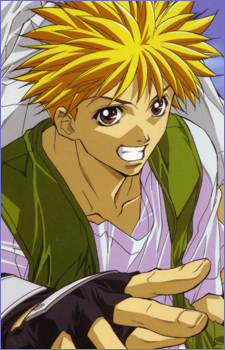 Despite Ginji's dark past, his demeanor is one of an unassuming, energetic, and friendly boy with a strong sense of justice. He makes friends easily, often without trying - and is trusting and open to an almost naive extent. But when exposed to remnants of his past, he has a tendency to revert to his darker "Raitei" persona. For comical purposes, he also turns into a droopy Chibi, most likely designed after a tare panda. He's frequently beaten up by Ban (comically) for doing stupid things. Little of his past is known. We do know that his childhood guardian is Takeru Teshimine, then ruler of the Infinity Fortress. Before his departure, Ginji founded "VOLTS", a gang lead by The Lightning Emperor, and "The Four Kings of the Volts" to protect the Infinity Fortress from the monsters of the Beltline.